Strokes, vision problems, arthritis and other conditions don't just affect people. Pets also develop serious health problems that change their lives. Fortunately, you can help your handicapped pet enjoy a comfortable, happy life by making a few modifications to your home. Use Non-Slip Surfaces. A fall can be devastating to a pet that already has a disability. Prevent falls on stairs by adding non-slip treads to the steps. Secure area rugs with double-sided tape or heavy furniture to prevent falls. If you have slippery, glossy floors, consider buying non-slip booties for your pet. Take Advantage of Textures. A change in texture can provide valuable clues to a blind or visually impaired pet. Rough carpeting placed above and below staircases offers a warning sign, while a rug under your pet's bed helps your dog or cat find a favorite resting place easily. Choose Easy-to-Access Beds and Litter Boxes. When have pets have mobility or joint issues, it can be very difficult for them to raise their legs high enough to step into beds and litter boxes. Choose products that offer low sides instead. A large floor pillow is a good substitute for a pet bed, as long as it offers a washable cover. If balance is an issue, choose a bed with a low front and high sides. The high sides will support your pet and prevent it from falling out of the bed. Raise Food Bowls. A raised feeding station makes eating easier for pets with orthopedic or neurological conditions. Add Ramps and Steps: Arthritis, hip dysplasia, stroke and neurological diseases can make it difficult for pets to jump on couches or beds. If your pet is used to sleeping with you, the change can be difficult for both of you. Ramps and steps are fairly inexpensive and allow pets to easily access their favorite resting spots. Use Training Pads. There are bound to be a few bathroom accidents if your pet has a disability. Put a puppy pad near the door in case your dog can't quite make it to the backyard in time. Adding a pad next to your cat's litter box can also be helpful if your pet sometimes overshoots the box when defecating or urinating. 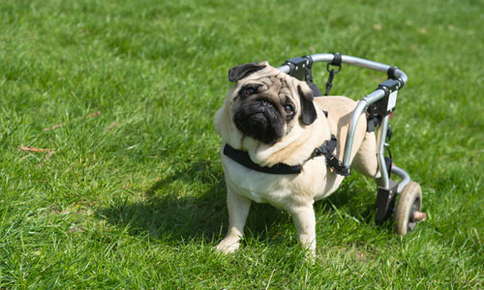 Consider a Mobility Cart: Strokes and other conditions can paralyze your pet's hind legs, making life very difficult. Although some pets become very adept at moving by dragging their hind legs behind them, scooting can cause sores on the skin. Two-wheeled carts restore your pet's mobility. The lower part of your pet's body rests on the cart, while his or her front legs are free. Carts are specially designed to allow your pet to urinate or defecate while attached to the cart. Keep Pathways Clear. It's important to keep floors clear of clutter, particularly if your pet is blind or has some degree of vision loss. Even small objects can throw off your pet's balance. Pet-Proof Your Home and Yard. Bumping into the sharp edge of a coffee table can injure your pet. Get down on your hands and knees and look for potential hazards. Use baby gates to prevent your dog or cat from falling down the stairs, and pad sharp edges of furniture to prevent injuries. It's just as important to ensure that your yard is free of tripping hazards. Ask your children to pick up and put away toys and remove gardening and other supplies promptly. Buy New Toys: Visually impaired pets can find toys easily if they make some noise. When each toy produces a different sound, it will easier for your pet to differentiate between them. Regular veterinary care is important for all pets but is particularly important for handicapped pets. If you're concerned about your pet's health or need a little help managing a disability, call us to schedule an appointment.